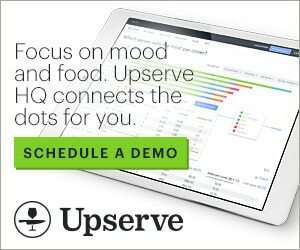 Upserve integrates with best-in-class partners who are experts in restaurant inventory, labor, online ordering, accounting, and more. Since this post was first published on Aug. 31, 2017, Upserve has vetted seven more companies that have received the Upserve seal of approval to join the marketplace: GratuitySolutions, SynergySuite, Localstake, BeerBoard, Spendgo, Upserve Loyalty, Opticard, Upserve Online Ordering, and Upserve Inventory Management. With dozens of competing restaurant technology companies vying for the attention of busy restaurateurs, buyers are getting overwhelmed with sales pitches promising better, money-saving tech. They’re forced to evaluate solutions based on merits of review sites, other restaurant owner recommendations or quick searches online. Moreover, this has created what the New York Times calls a “Tech tower of Babel” with most systems speaking their own dialect. 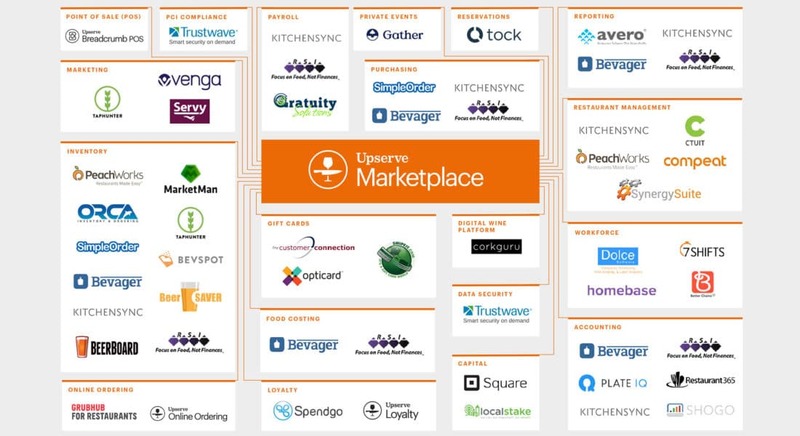 To help cut through the clutter and let you decide the best option for your restaurant, Upserve has vetted dozens of products on the market, identifying industry-leading technology and teams, big and small, and carefully selected those that offer the best solution for every aspect of running a restaurant. Here is your at-a-glance resource guide for choosing the best of the best that the marketplace has to offer in restaurant employee and workforce management, accounting, restaurant management, online ordering, inventory management, capital/expansion financing, data security, gift card administration, point of sale (POS), and more. Here is your at-a-glance resource guide for choosing the best of the best restaurant industry-leading technology. We’ll keep updating this list as more companies get vetted and receive the Upserve seal of approval, so bookmark this page and come back often to get the latest rundown. To toggle through the companies in each category use the arrows on either side of the image. Plate IQ is an accounts payable automation platform for restaurants, consultants and restaurant accounting firms. Plate IQ allows you to manage your accounts payable (AP) and monitor your expenses with data extracted directly from your invoices. Bevager and Foodager are full purchase management systems that span the entire purchase-to-pay process: distributor ordering, real-time inventory management, recipe costing, invoice/AP processing, and POS-driven depletion and purchase analytics. This eliminates all manual and redundant admin across the restaurant and puts operators, managers and accountants all one platform, from any mobile device. KitchenSync provides online bookkeeping and payroll services to independent restaurants, franchises, and hospitality groups. Just connect your bank and POS, scan your invoices as they come in, and watch your financial reports update daily on our platform. From ingredient price change notifications to controller-audited profit & loss statements, KitchenSync compiles all of the essential reports needed to run your high-volume restaurant. Services also include complete AP and payroll management. Restaurant365 is a complete restaurant management solution specializing in multi-unit restaurant businesses of all concepts. It offers complete integration to your current POS system and has marketing, catering (event management), operations, accounting (yes, you can get rid of QuickBooks), and franchising modules. For the first time ever, restaurants can put their entire management, marketing, sales, and finance team on the same system. Shogo’s cloud-based web service automates the accounting process between your Restaurant POS and commonly used accounting packages, including Quickbooks and Xero. Once configured, Shogo automatically post sales activity at the end of each business day. Square Capital provides qualified Upserve restaurants access to the financing they need to take the next important step in their business. Over $1 billion has been extended to more than 100,000 sellers* through Square Capital, giving them quick access to funding to meet their needs — whether to purchase inventory, open a new location, help cash flow or buy equipment. Eligible restaurants can apply for a loan quickly and conveniently, and, upon approval, receive their funds in as little as one business day. While other lenders may bury fees in fine print, Square Capital clearly informs restaurants the total cost of the loan up front. There are never any hidden costs or surprises. Localstake helps restaurants, bars, brewpubs and taprooms prepare, close and manage crowdfunded investment capital. Localstake makes it easy to connect with individual investors, present an investment opportunity, close funding and manage the capital moving forward. Whether your capital need includes inventory purchase, location expansion or equipment, the Localstake platform and team of advisors can assist you in planning and executing the raise that fits your circumstances. Trustwave runs some of the largest Level 4 merchant programs in the world. Through its credit card processor, acquiring bank and independent sales organization (ISO) partners, Trustwave provides Payment Card Industry Data Security Standard (PCI DSS) compliance validation and information security solutions to more than three million merchants. The Merchant PCI Compliance and Security solution features TrustKeeper® PCI Manager and integrated security tools to help deliver and improve your merchants’ overall security posture, while simplifying and automating the process of developing a merchant program customized to your requirements. TapHunter allows you to have better and more engaging menus that can be updated in seconds and makes it super simple for you to get the word out to your customer base about new items.TapHunter helps bars and restaurants save time and sell more via a suite of operational and marketing tools, including print menus, digital menu boards, social media posting and monitoring, website menus and inventory management. Instead of having to update multiple platforms whenever your menu changes, simply update your TapHunter dashboard or TapHunter Manager mobile app and instantly notify your customers while displaying up to date menus. CorkGuru allows wine professionals to market their wine inventory, publish an accurate digital wine list, and send exclusive offers to guests’ smartphones. It is the first digital wine platform focused on guest relationship management (GRM). CorkGuru enhances the guest restaurant wine experience by engaging guests not only while at the restaurant but also before they arrive and after they leave. CorkGuru enables wine professionals to manage wine inventory; publish an accurate digital wine list to their website, iPhone guest app and CorkGuru for iPad (wine menu app for front-of-house); and send exclusive offers directly to guests’ smartphones. For over 30 years, The Customer Connection (TCC) continues to develop and administer customer relationship marketing programs that meet clients’ specific needs, which includes loyalty, gift card and e-commerce services, birthday programs, and email marketing for thousands of restaurants, hospitals, retail and major tennis events throughout the United States. Dedicated account executives provide assistance in implementing a unique program to designing and printing of collateral program materials. Catering to all restaurant types, Swipe It helps businesses start and operate custom gift card programs. From free custom card design and production to implementation into your restaurant POS system, Swipe It helps get the best ROI on your card programs. Restaurants who participate in our turnkey ecommerce program benefit from increased revenue by offering physical and instant eGift Card from their website and social media platforms with Swipe It handling the order fulfillment. Opticard is a global and industry leader in implementing and managing a variety of stored-value/gift card-based programs. We build programs that last by helping you keep your customers happy and coming back. Opticard’s promise is to make it easy for you to build customized programs that offer rewards and convenience to your regular customers encouraging them to return more often and spend more on each trip. 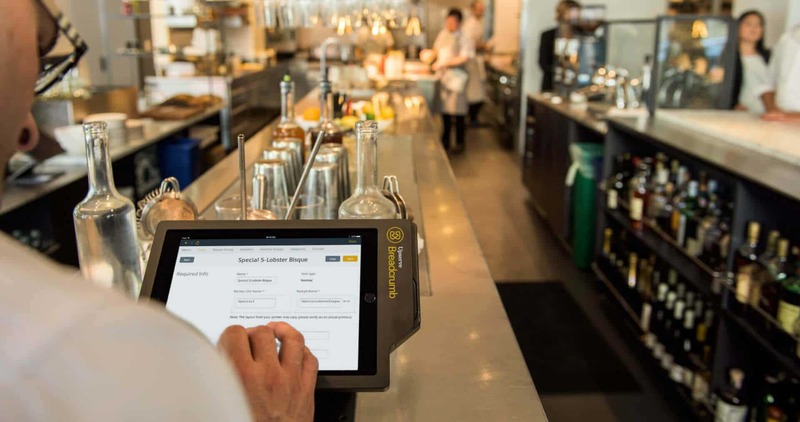 MarketMan helps restaurateurs save time with ordering, fulfillment and accounts payable while maximizing efficiencies with inventory, leading to less waste and increased profitability. It is a dynamic, cloud-based inventory management and purchasing solution focused on streamlining procurement, delivery, accounting, and profitability for F&B establishments of all kinds. MarketMan provides advanced inventory and order management features that track the cost of goods sold, examine your entire purchasing history and stay on top of inventory. SimpleOrder is an all-in-one back-of-house purchasing and inventory platform designed to optimize restaurants and restaurant chain operations. SimpleOrder is designed to cut waste, reduce food costs and improve a restaurant’s bottom line. The cloud-based platform and apps feature sales-integrated automatic inventory replenishment, real-time food costing and online one-click purchasing from all of your suppliers. BevSpot is an intuitive web-based beverage management tool that increases accuracy of your bottle counts, dramatically reduces the time it takes to complete inventory and ordering and, when combined with POS data, provides real-time performance insights that lead to better decisions and increased profits. BevSpot is easy to use, works with your existing computers and aligns with your current work. 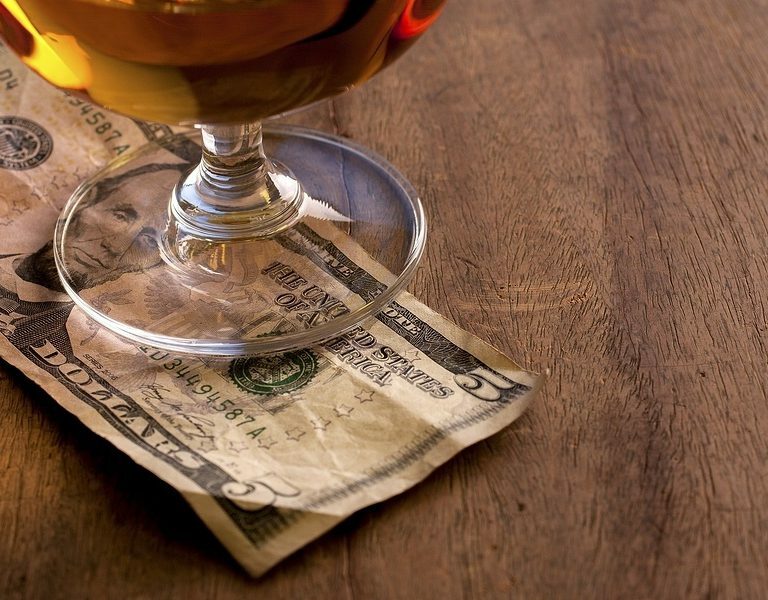 BeerSAVER and Wine Control System is the number one draft beer monitoring system in hospitality by monitoring unaccounted pours and over-pours. They provide an end-to-end solution for bars and restaurants that eliminates industry losses of 23 percent. BeerSAVER provides online remote access to manage and to monitor pours vs. sales figures to ensure all inventory generates revenue, thus minimizing unnecessary waste. PeachWorks is the provider of the Peach platform, a cloud-based restaurant operations platform designed to simplify and streamline the business functions of running a successful restaurant. The Peach platform is a flexible, app-based system that incorporates staff scheduling, inventory management, manager logs, visibility into point of sale data, employee communications, and more. PeachWorks offers a collection of apps to tackle all of the toughest back-of-house chores, including inventory, scheduling, managing recipes and nutrition, tracking tasks and team communication. Orca Inventory is first-in-class, providing inventory tracking and control, budgeting tools, vendor ordering, invoicing and receiving, robust financial statements, and recipe costing. Easy to use with average savings of 5 percent off cost of goods sold. Included with your purchase is integrations with Upserve POS, most major U.S. vendors, and QuickBooks Desktop and Online. Orca is cloud based and accessible from any browser, any computer, anywhere in the world. Imagine knowing your cost of goods sold in real time from anywhere. BeerBoard is the Integrated Beer Management & Guest Display System. BeerBoard captures ACTUAL draft volume poured by the minute, and our platform extends to digital applications to enhance brand merchandising at the point of purchase. With BeerBoard, operators know what is pouring and whether or not that product poured is actually sold. 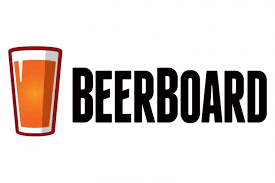 BeerBoard reports show retailers their best-selling brands, the success of promotions, etc. Spendgo is a loyalty marketing platform best utilized at counter service concepts. We utilize customer facing displays to engage customers at every transaction generating thousands of sign-ups. Engage your customers 1 to 1 by collecting insights at every touchpoint while building customer journeys across any channel – email, sms, social, mobile, online, in-store, payments and through digital advertising. It’s time to give your loyal customers a program that is designed for them. Upserve Loyalty leverages your customer’s credit cards as their loyalty card, making it easy to earn points, and even easier for you to gather data about your loyalty members in the Upserve HQ Guestbook. Market to each loyalty customer at an individual level and learn what turns guests into regulars to keep them coming back while driving more revenue from your regulars. Venga provides business intelligence and CRM platform for restaurants. Venga’s technology enables restaurants to track and analyze their customer’s purchases, habits and preferences. Venga Intel Reserve enables users to merge their reservations with their point of sale data to automatically provide guest intelligence for restaurants. Venga Instant Feedback enables guests to provide private feedback from their phone. Venga Engage enables users to connect guests via their phone. Grubhub makes it easy for hundreds of hungry diners to find your restaurant through our online ordering platform. List your restaurant on the Grubhub site and app, and you’ll gain exposure to potential new customers. Grubhub also help grow your business with marketing support, easy-to-use technology, and delivery drivers. After joining Grubhub, restaurants increase their order volume by an average of 30 percent and see six times the growth in revenue annually. There is no upfront cost, and you only pay when it sends your orders. Upserve Online Ordering makes online ordering faster, easier and more cost effective. Let diners order directly from your website without the headache of managing multiple menus, transcribing orders or ballooning commissions. Upserve Online Ordering, integrated with Upserve POS, gives restaurants the ability to add a significant revenue stream without disrupting operations that they depend on. It delivers order accuracy, efficiency, happy diners and a new revenue stream. Chowly integrates Restaurant Aggregator (UberEats, Eat24, etc.) orders into the restaurant’s current POS system so staff members don’t waste time manually entering them. Chowly lowers staffing costs by eliminating the need for staff to do data entry. Eliminating this need allows restaurants to add on as many platforms as they wish increasing their net sales. Their automated solution vastly decreases errors as orders are always inputted correctly and quickly. GratSync Cloud connector is in direct communication with customers’ Breadcrumbs cloud based Point of Sale (POS) system. With GratShare web portal, a restaurant can automatically allocate TIPS/wages and produce and retrieve TIPS related reports. GratSync& GratShare eliminates the time a manager must spend behind closed doors calculating, allocating and distributing TIPS and further eliminates the mistakes associated with miscalculations. Upserve POS runs on the Upserve Restaurant Platform, connecting payments and the richest insights available with your restaurant or bar POS. It includes Upserve Marketplace (everyone on this list) so you can easily integrate with solutions — from inventory to labor management — that you already use. Gather believes planning special events should be a seamless, fun experience. Its cloud-based event management software is re-imagining the way events are planned, managed and executed, empowering thousands of restaurants and venues across the U.S. to successfully grow their events business. Gather helps venues get it together so their guests can get together. The Avero platform enables front line managers to make quick and proactive decisions which ultimately drive deeper sales insights, reduce prime costs and enforce tighter operational controls. Working with FSR groups and Hospitality groups who want to understand and evaluate the different segments of their restaurants, Avero software has powerful restaurant solutions that improve profitability and the guest experience. Its restaurant management software is tailored to the way you work. Whether you are on the floor, in the kitchen or on the go, Avero’s industry-leading restaurant analytics software provides you valuable insights so you can make better decisions for your restaurant. Tock is a comprehensive reservation and table management platform, built to help restaurants, bars, and wineries run better businesses and highlight their unique culinary experiences, all while providing superior hospitality. Ctuit Software offers comprehensive restaurant management solutions to help restaurants reduce food and labor costs while streamlining operations. Ctuit has three products to help restaurants succeed: RADAR, On The Fly™, and Ctuit Schedules. RADAR streamlines restaurant activities and provides management teams with insight to financial and operational performance. On The Fly™ is a mobile app powered by RADAR that connects managers to vital restaurant data in real time. Ctuit Schedules allows employees to receive schedules, trade shifts, request time off, and send messages through any mobile device. One vendor, one login. That is what their customers love. Compeat is an end-to-end restaurant management system. The Compeat solution begins with Intelligence, a dashboard integrating their accounting, inventory, logbook, labour, schedule and onboarding solutions. There are more than 7,000 restaurants locations using Compeat today. SynergySuite Restaurant Management Software covers all critical business areas including inventory, purchasing, recipe costing, food safety, scheduling, cash management, human resources, and business intelligence. It helps restaurants boost efficiency and profitability in all critical business areas, resulting in 4-8% food and labor cost savings. Better Chains is a workforce optimization solution for the hospitality and retail industries. The cloud-based platform provides operators one location to digitally manage their HR, training, scheduling and ops, creating control, compliance and consistency throughout their business. Whether it’s switching to paperless HR, finding quality employees, giving engaging training with results, correctly budgeting labor, or having better control of daily operations. Homebase solves three major headaches for restaurants: time tracking, employee scheduling, and team communication. Homebase makes hourly work more productive. More than 60,000 businesses rely on Homebase’s scheduling, time tracking, and team communication platform to help them simplify their day-to-day job, giving them hours back in their week. As former hourly employees and managers themselves, they are dedicated to supporting businesses with relevant advice to help them make the most of Homebase and their business. (Comes free with Upserve POS). 7shifts is easy-to-use staff scheduling software built for restaurants. Save 80 percent of the time normally spent on scheduling and 3 percent on your labor costs. Its drag-and-drop schedule creator pulls in availability to eliminate conflicts, while an integrated chat system makes it easy to communicate with your staff. 7shifts also provides free mobile apps to help you manage schedules on the go. Managers can create or adjust the schedule from their phone and employees always have access to their shifts. Dolce is the first and only labor software that allows you to view time-punches with shifts on a single screen with real-time sales from your restaurant POS. Viewing projected versus actual sales against labor, down to the shift level, drives profitable business management. Save time with POS-integrated tip pooling and payroll. Track overtime and reduce risk with labor compliance. Employees love scheduling, shift swapping, and communication on Dolce’s mobile app. Get time back in your day while you boost sales by 30%, increase staff productivity, and manage your restaurant from anywhere, 24/7. When she's not debating with her young sons about which Star Wars character is the best one, Carol Lin is likely to be ordering a Lychee martini and spicy tuna roll at her neighborhood sushi joint. 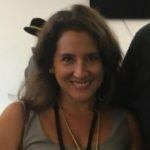 She loves controversial (but delicious) foods like foie gras and haggis, and believes there’s few problems that a conversation over buffalo wings and cold beer can’t solve.